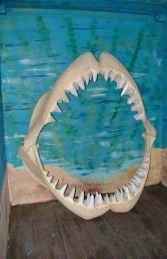 This small set of Shark Jaws has amazing teeth and is an excellent model for adding drama to any pirate, marine, oceanic, surfing or beach themed area. This fabulous small set of shark jaws is a great way to make a dramatic statement in any marine themed area as it is ideal for mounting on a wall or partially burying in sand etc. We also have medium and large sets of shark jaws available. The teeth on this model are really fearsome, the jaws look great used with our other marine beach themed items.